Employers take note! This may seem unorthodox and surprising but the numbers speak for themselves. 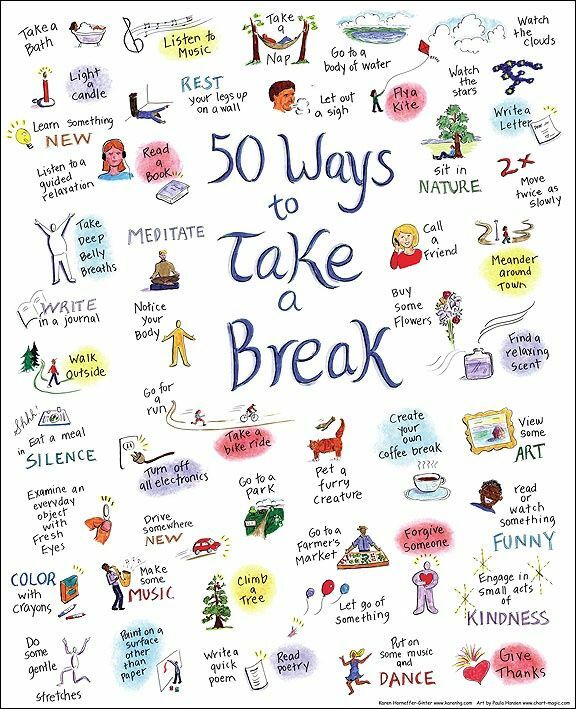 Encourage your staff to take more breaks in order to increase productivity. Allow staff to be social. Socializing having a bit of down time at work with friends is good for productivity, according to a 2007 study reported in the Journal of Socio-Economics. Allow staff to nap. Taking a nap during worktime can boost performance and alertness, according to a NASA study of astronauts and pilots. They found that a 40-minute nap improved performance by 34% and alertness 100%. Allow staff to work with a flexible schedule. Having flexibility built into one’s workday helps reduce stress, according to research from Global Workplace Analytics. 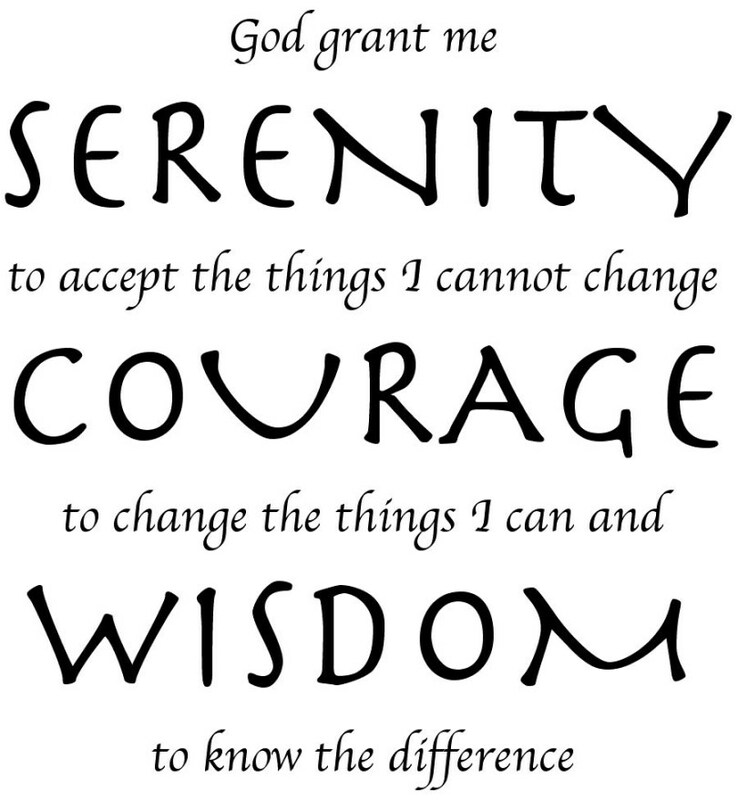 In the early 1930s, Reinhold Niebuhr was attributed to first creating the “serenity prayer” in his sermons. Winnifred Crane Wygal, a pupil of Niebuhr, included the prayer in her 1940 book, We Plan Our Own Worship Services,attributing it to Niebuhr. The prayer has been adapted and changed into what we read below today and is used in many mental health and 12-step programs. Pray more for wisdom and strength. This is a simple prayer or phrase to remember and remind yourself when you are feeling stressed out. It is freeing to realize that we do not have to control everything, as humans, we cannot control everything. Instead it is helpful to have a higher power to take control of the things we cannot control. Although, this statement can be adapted for people who do not recognize a higher power. The principles are still true, despite religion. You are only in control of yourself and no one else. While in life, there are many things that one cannot control, so the goal is to let those things go and not stress out about those things. 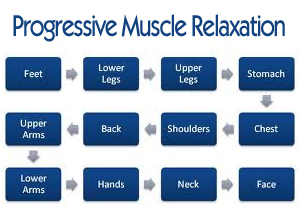 Progressive Muscle Relaxation is a common intervention that does really help people relax. This is a great, easy intervention that can be done in a chair or laying in bed. The image below shows the how-to steps. Basically, you focus your attention on one muscle group at a time by tensing/tightening the feet up for ten seconds then relaxing that same muscle group after ten seconds. Next you move to the next muscle group. The chart above goes backwards from how most experts suggest doing this exercise. I find it is better to start with feet and then work up to the face, like the chart below shows. Another tip for this exercise is to remember to focus on breathing through-out the process. Attempt to take in deep belly breaths of oxygen. Remain as calm as possible and just relax. This exercise can put you to sleep, even after a long, stressful day at work. If you are having trouble focusing and doing this exercise alone, have someone else do it with you. Better yet, find a professionally trained counselor, social worker or life coach who can help you facilitate this intervention. This expert will help you remain calm, focus on breathing and learn to relax. 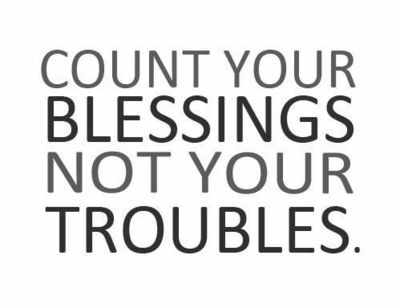 A very simple intervention to help reduce stress is to focus your thoughts and mind on the good things in life and off of the negative things in life. Take a moment to think of three things you are grateful for right now. Also list three things you like about yourself! 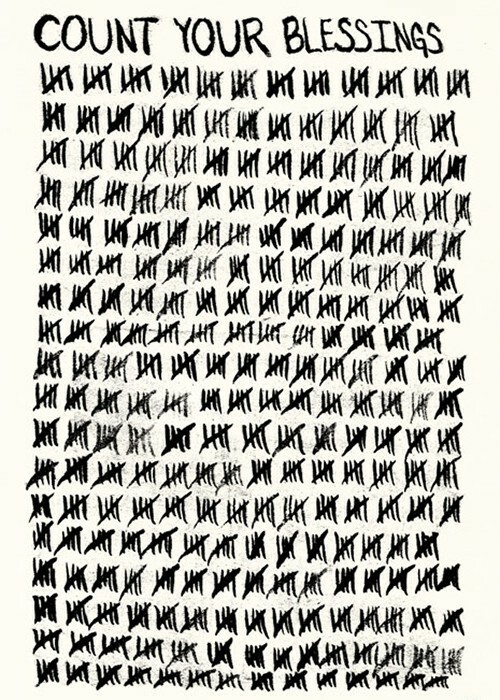 You may be surprised when you do start counting all the little blessings in life. They rally add up! 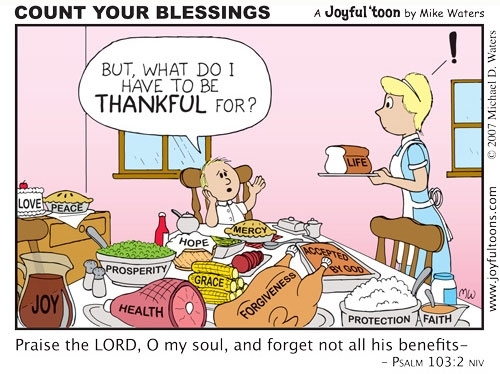 Especially in America, we are so blessed and have so much to be grateful for! What are you thankful for today? 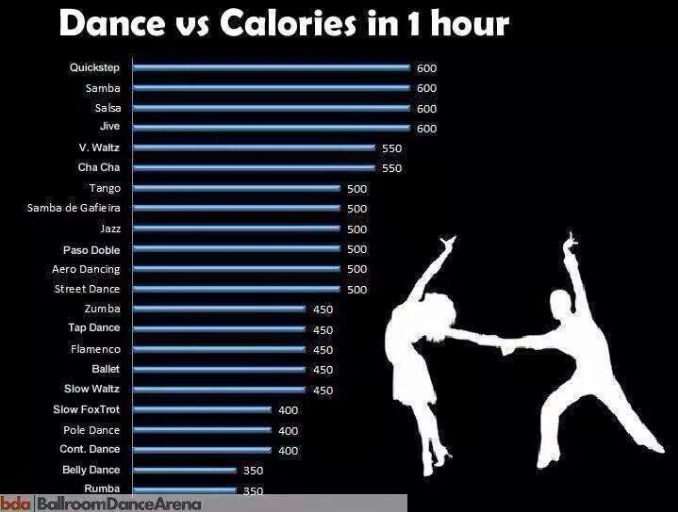 Dancing is a fun, fast and potentially even romantic way to burn calories! 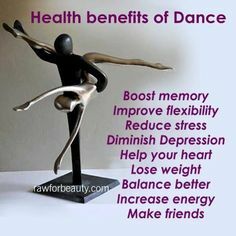 Dancing, whether a focused formal type of dancing, a social Zumba dancing or a wild night at the club, all have many other health benefits as well. Dancing is a great way to distract yourself from a stressful day at work. So get out there with friends, or go-it-alone and just have some fun and “just dance” as Lady Gaga suggests. This poster is a great reminder that it takes some effort to actually execute good listening. Good listening is focused or active listening. The first step to active listening is getting in touch with the body’s sense of a particular situation or issue. The old adage, “know thyself” is key before trying to help or listen to others. Recognize your own emotional and physical status. If you are having a rough day, then you will have to work even harder to pay attention to other people’s emotional status. The next step is to focus in on the situation. Pay close attention to the particular event and/or feelings around the event. Look for specific words or images then come to describe the felt sense. 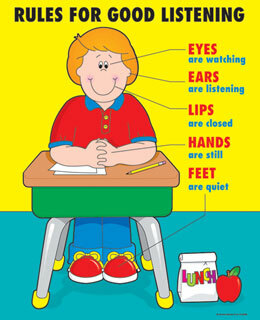 For example, when you see a fellow friend or colleague walking around the office, look for his or her body language. Is he or she looking down or up? Notice his/her facial expressions. Are his/her shoulder and neck bent a certain way? Notice tone of voice. Listen to the words this person uses….are they positive, neutral, sarcastic? The next component is the focusing attitude. It entails staying respectful, friendly, and welcoming towards whatever emerges. If you are judgmental and critical, that attitude stifles the inner voice and closes off communication with your deeper self. Active listening requires you to be mindful of other people’s emotional vibes and then also keeping your own emotional status in check at the same time. It can be an incredibly difficult task. Although, it can also be an incredibly freeing task. Nurses, often use this focused listening on the job. This sort of focused listening gets their focus off of the immediate traumatic stress and puts the focus on the client. Not only does this help the nurse to distract from stress, it also improves the treatment and care that the hospital provides. Through active listening, you may be able to distract yourself from your own stress by focusing in on someone else. Also this becomes win-win as you can make someone else’s day by actively listening for them. Learning new things is a distraction or break from your current life situation stressors. Learning new things has many benefits. Learning something new can reduce stress. Once you find a new hobby that you enjoy, that hobby is a break from reality, it is distraction from our daily worries! When we have success in our new hobbies, we gain more confidence in ourselves. When these two things are combined together, you will also improve your mental health. One reason why learning has a positive impact on our mental well-being is that it is often about setting goals or targets and achieving these. This sense of achievement is an important part of your mental sanity.